Embark on a scenic cruise into the Alaskan wilderness that guarantees you will see wildlife, including whales! Travel by deluxe catamaran served by a knowledgeable naturalist and attentive crew. This is a great opportunity to view and learn about whales, sea lions, porpoise, seals, bald eagles and other species of wildlife. This sightseeing cruise features guaranteed whale watching! Following a short motorcoach ride to scenic Auke Bay, you’ll board a waterjet-powered catamaran specially designed for wildlife viewing. Relax in the warm, comfortable, spacious main cabin, surrounded by large windows as your experienced captain guides you through the island-studded waters of Stephen’s Passage. Against a majestic backdrop of snow-capped peaks and glaciers, the onboard naturalist will explain the behavior and habitat of wildlife you may encounter, including humpback and killer whales, Steller sea lions, Dall’s porpoise, harbor seals, bald eagles, bears and deer. 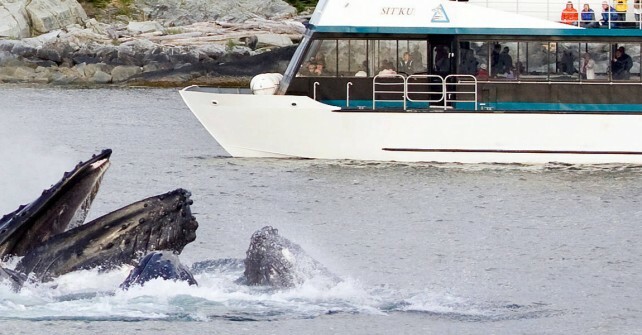 This tour guarantees you will see a whale. If not, you’ll receive a $100 cash refund as you disembark the vessel. But don’t anticipate a refund; in the past 15+ years whales have been sighted on every tour! To fully enjoy the sights and sounds of a close encounter with wildlife, be sure to bring a warm, rainproof jacket to wear on the topside observation deck and don’t forget your camera! Day-use binoculars and a souvenir wildlife guide & map are provided, along with complimentary snacks and beverages. Accessibility: This tour is wheelchair accessible. Combined weight of guest and mobility device cannot exceed 600 pounds. Mobility devices must have a maximum length of 48-inches, a maximum width of 32-inches, and minimum ground clearance of 3.5-inches. This tour guarantees whale sightings on every voyage- if not, you'll receive a $100 cash refund. 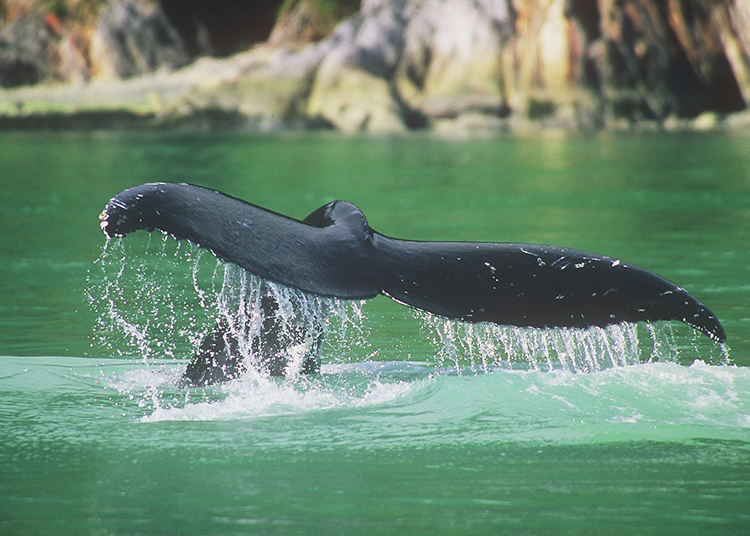 In the past 15+ years, whales have been sighted on every tour! Every voyage is unique; custom-designed by your experienced Alaskan captain and crew. You'll have the opportunity to view humpback whales, orca, sea lions, porpoise, seals, eagles, and more! Our 100% whale-viewing success rate, exceptional crew performance, and superior vessel design has combined to make this tour a multi-year winner of the "Shore Excursion of the Year" in Juneau! Dress warmly and bring a rainproof jacket to wear on the observation deck.